In the garden, creeping along branches, hiding under stones or flitting from flower to flower, a whole universe of creatures is waiting to be discovered. Butterflies, moths, beetles, wasps, spiders... what have you found in your backyard? Did you know that chorus cicadas live und... read full description below. In the garden, creeping along branches, hiding under stones or flitting from flower to flower, a whole universe of creatures is waiting to be discovered. Butterflies, moths, beetles, wasps, spiders... what have you found in your backyard? Did you know that chorus cicadas live underground for most of their life? That bumblebees have smelly feet? That some species of stick insect are all female? Or that earwigs don't actually crawl into ears? In New Zealand's Backyard Beasts, children (and adults) can learn to identify some of the creatures most commonly found in the backyard. Beautiful illustrations are accompanied by informative text and fascinating facts. New Zealand's Backyard Beasts includes bees and wasps, beetles, butterflies and moths, mantises and stick insects and w?t? (insects), centipedes and millipedes (myriapods), spiders (arachnids), snails and slugs (crustaceans) and more. The book also introduces the magical transformations of complete and incomplete metamorphosis that insects undergo in their lifecycle. 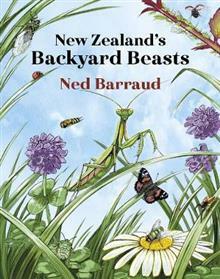 From the simply curious to the budding entomologist, New Zealand's Backyard Beasts will please and inform all age groups about the fascinating creatures found in the back garden. Whether just looking at the beautiful illustrations or absorbing the facts, this book is a must for all backyard adventurers. NED BARRAUD is an illustrator with a keen passion for the natural world. For as long as he can remember, Ned has been fascinated by the form and beauty of the insect kingdom, with some of his earliest artwork depicting beetles, shining like jewels. Ned illustrated all six books in the award-winning `explore & discover' series, along with the forthcoming Animals of Aotearoa. He released his first fiction title, Moonman in 2014, and the acclaimed Watch Out for the Weka in 2017. Ned works at Weta Digital as a texture artist. When he's at home with his wife, three children and menagerie of pets, Ned enjoys exploring in the garden, discovering new bugs, creating habitats and making weta hotels.